F1 rule makers have announced its decisions from meetings in Geneva on Tuesday with the new qualifying knockout format being unanimously voted in, new cockpit safety measures introduced for 2017 and the revision of regulations postponed until the end of April. The new rules and formats have been confirmed and supported by the FIA after a series of high-pressure meetings between the F1 Strategy Group and the F1 Commission, as it aimed to deliver new regulations for a 'faster and more spectacular' sport. Headlining the changes for the 2016 season is the alterations to the qualifying which introduces a new elimination format into the existing Q1,2,3 model. o 2 drivers left in final 1 minute 30 seconds"
Another new feature for 2016 will be the debut of an F1 Driver of the Day award, implemented by F1's commercial rights holder alongside television broadcasters with the aim of 'greater fan engagement'. Fans will be allowed to vote online for a 'Driver of the Day' during each Grand Prix and the winner announced after each race where the driver will be handed a prize regardless of their finishing position. What the prize includes has not been decided. Looking to the future of the sport, which had been the main source of friction between teams and stakeholders, the 2017 sporting and technical regulations deadline has been extended until the 30th April 2016 to give parties more time to come to an arrangement. The original deadline of 1st March 2016 has been scrapped. The regulations will also cover the future of the power units in regards to: Supply cost, obligation to supply, performance convergence and further improvement of noise. It will apply to all existing engine manufacturers. Despite failing to come to a conclusion on regulations, the FIA has confirmed new cockpit protection will be introduced from 2017, with the 'Halo' concept tabled by Mercedes being the preferred option. The FIA says other options will also be evaluated before a final design is confirmed. The decision comes after Jules Bianchi and Justin Wilson both died as a result of their injuries after being hit on the head in open cockpits. The concepts have been received with mixed reviews by some drivers but the FIA is keen to act to prevent any further accidents due to a lack of cockpit head protection. Finally, 2017 will also see new bodywork regulations to create 'more exiting cars with additional downforce' with the overall aim of faster cars and lower lap times. In summary the tyres, suspension, aerodynamic and bodywork parts will all be allowed to be made bigger which is believed it could make cars go up to three seconds a lap faster due to bigger downforce. 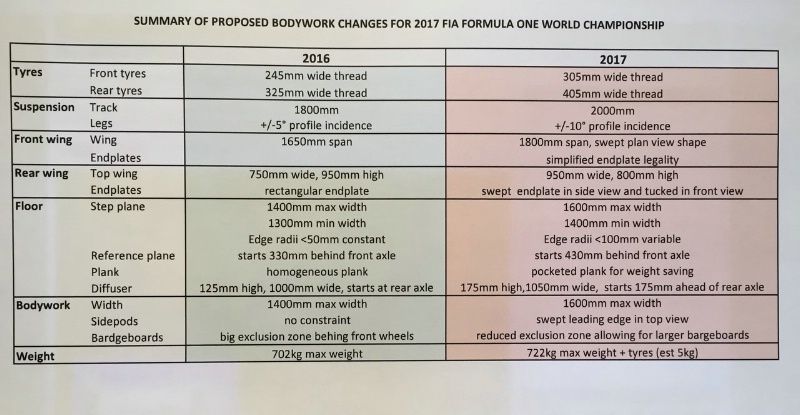 See image below for full proposed bodywork changes. The FIA will work in coloration with Pirelli and teams on solutions for new tyres compounds which will be able to cope with the additional loads and stresses from the new designs. The 2017 technical regulation changes will still needed to be approved by the World Motor Sport Council before any final confirmation from the FIA.